This product is listed due to a customer testimonial. No tests have been conducted by innovaphone. A major provider in the market of customer interaction management solutions for contact centres, Conecteo offers Kiamo, the native multi-channel software solution. Kiamo CAPTURES, PRIORITISES and DISTRIBUTES all multimedia flows depending on business rules, availability and employee skills. Designed for all users, the solution stands out from the competition due to its rich functionality, ergonomic design and reliability. Kiamo responds to the problems of Customer Relations managers who need a unified customer strategy to improve their quality of service and relational performance. Deloitte Technology Fast50 winner Conecteo bases its growth and durability on a solid team, having developed unique expertise in the implementation of contact centres within major companies and government departments, in heterogeneous environments. ISTQB Certification The Conecteo Quality team signed a partnership agreement with ISTQB® (International Software Testing Qualifications Board) due to its maturity regarding software tests, obtained through individual certifications. The ISTQB® partner programme recognises organisations which have adopted a qualitative approach to software testing. ISTQB® certifications are recognised internationally and act as testing reference. The signature of this partnership confirms Conecteo's objective: deliver reliable, stable and efficient software. Kiamo is an open solution which is deployed rapidly and securely, without having to adapt the telephone architecture or information system already in use in your company. Kiamo has numerous native and customizable connectors (CRM, ERP, DB, Quality Monitoring, etc.) allowing it to interface with the main Customer Relations business software (SAP, Salesforces, Coheris, MS Dynamics, etc.). Kiamo is available in hosted or on-premise mode. Via a single interface, Kiamo centralizes, prioritizes and distributes all inbound and outbound interactions (calls, emails, live chat, social networks, Web, paper mail, etc.) between customers/prospects and the Customer Relationship center. With its advanced and particularly ergonomic functionality and 100% multi-channel capacity, the Kiamo solution appeals to both large companies and SMEs. Easy to configure, Kiamo allows men and women working in contact centers to concentrate on their core business. By streamlining response processes and focusing on automatic management and prioritization of the flows in customer relationship centers, Kiamo helps companies increase their productivity, guarantee customer response times and develop customer loyalty. The Kiamo solution has been installed for several years in companies of all sizes involved in different lines of business. Based on its powerful native multi-channel engine allowing it to manage hundreds of thousands of interactions simultaneously, Kiamo presents itself as the daily productivity tool of contact center players in SMEs and large companies. 1. Multi-channel capture: of all your contact flows: voice, emails, files, paper mail, social networks, video messaging, back-office tasks, live chat. 2. Scheduling: thanks to automatic management and prioritisation of all flows, Kiamo organises, sorts and prioritises these according to your strategy. 3. 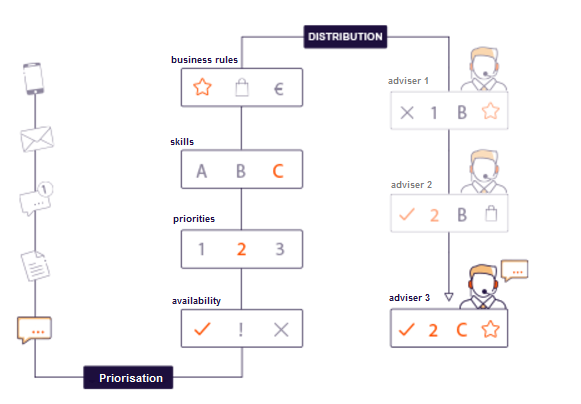 Intelligent distribution: taking into account all your business rules and the skills and availability of your agents, Kiamo assigns each task to the most appropriate adviser. 4. Measurement and management: You manage your activities in real time via customisable supervision interfaces and consolidated dashboards. Kiamo configuration guides are available in French, English.